The owners of Gilbey’s have been able to reach an agreement with their landlord to renew their lease, just as they appeared to be doomed to close. “We received an original quote for the new lease that we knew we couldn’t afford, but then came to an understanding with our landlord to meet each other halfway,” said Seamus King, a co-owner of the long-standing establishment on 32-01 Broadway. The new lease will allow them to operate at the Broadway corner for an additional 3 years with an option to renew. 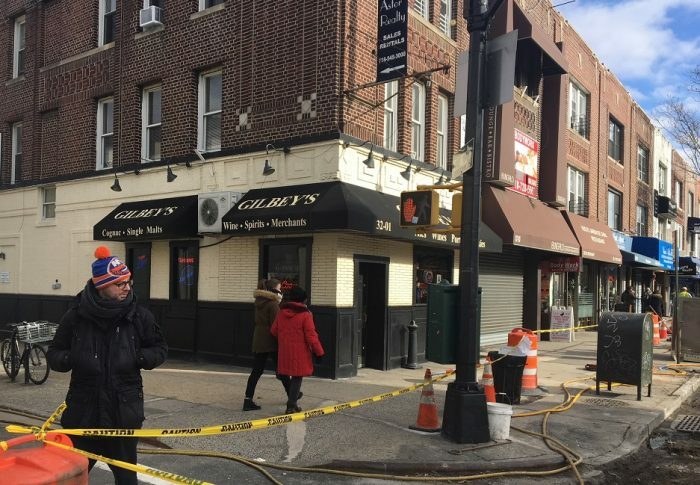 “The rent will still go up, but at a little over 3 percent…instead of what was originally quoted,” said Mike Cremin, a co-owner and part-time bartender at Gilbey’s. 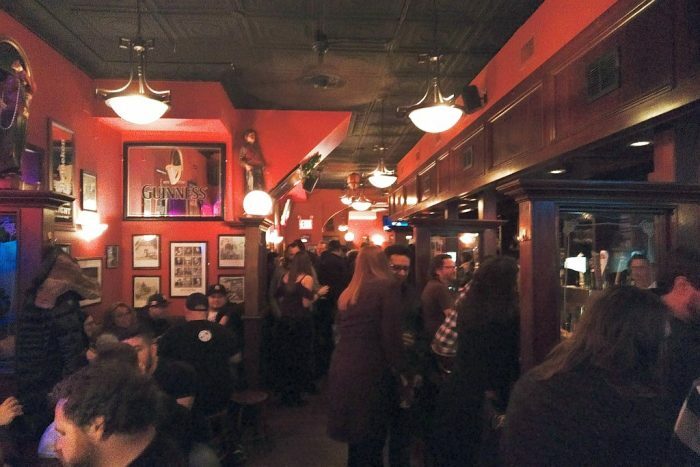 Seamus said that since news broke about their almost certain closure, scores of former patrons who moved out of Astoria had come back to visit the bar to have what they thought would be one last drink at the establishment. “We had people fly in from Ireland this week to wish us well, and I believe all the attention we received from our possible closure helped us keep this place in the end,” he added. The owners have plans to renovate their outdoor awnings that adorn the corners of Broadway and 32nd St., and are discussing the possibility of bringing back recurring events that they used to hold. A Facebook event organized by longtime patron Jennifer Duffy-Negri took place Saturday in what was going to be a farewell party for Gilbey’s. Instead, the event turned into a celebration once the owners let word out on Friday that they intended to remain on the corner of Broadway and 32nd Street for years to come. “We’re all so happy that they’re staying, us Gibney’s girls,” Jennifer said, referring to the name of the establishment before it was renamed to Gilbey’s in the late 1990’s. An unofficial page for the bar can be found here, or readers can find more information by calling (718) 545-8567. Well that is good news. Poor Joe’s heart can’t take any more uncertainty. Margret i don’t believe you have a dog you seem like the type to have 12 cats in a studio apartment. The new owner must of looked at the downward spiral Astoria has been having lately and decided to renew the old bar. Enjoy folks. They should go on Bar Rescue….. Absolutely elated! The guys deserve it. An awesome place where great times are to be had for the foreseeable future! So they will just charge more for drinks to cover the rise in rent in addition to making a profit off of the alcoholics. This is such a great end to a scary story. So glad that I will be able to continue to have a drink and meet neighborhood friends when I come back to visit. I’m tired of walking my dog and trying to avoid the vomit from the bar goers in this area on the sidewalk. Good news for me! Marg, I’m tired of walking to the bar and trying to avoid your dog. I didn’t know Gilbey’s was located in a dead end street where you have to pass by it to enter or exit the area!